Health Aid Vitamin E is a powerful natural antioxidant which supports vital nutrients like Vitamin A and unsaturated fatty acids from oxidation which can be harmful to the body. 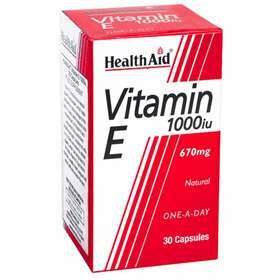 Health Aid Vitamin E is suitable for those who wish to boost their immune system and to maintain a healthy heart and skin. Improves blood circulation and stamina in sports people and athletes. To maintain a healthy heart. For adults and children over 12 years of age. Take one capsule daily after food. High dosage of vitamin E supplements should only be taken for a short period of time then discontinued for about two weeks before resuming once again. Natural Vitamin E (d-alpha tocopherol), Bulking Agent (soybean oil), Capsule Shell agent (gelatine),humectant (glycerol).